AKR regularly conducts refreshment training to ensure that the company’s S.H.E. 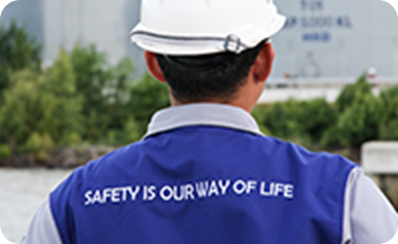 slogan, “Safety is Our Way of Life”, is completely understood and implemented in AKR’s daily activities. Zero Potential Fatality Accident (Occupational accidents resulting in possible loss of life). The commitment of S.H.E Management is realized in the implementation of S.H.E campaign and socialization aimed at instilling and raising awareness of workers and contractors on S.H.E, and evaluating the implementation process of safety control. The S.H.E. standard operation procedure is continuously evaluated and improved to adjust to the latest developments and higher safety standards. Compliance to the S.H.E. SOP is the responsibility of all stakeholders, including employees, contractors, suppliers, business partners, and visitors. The professional S.H.E. training team continuously conducts audits and S.H.E. 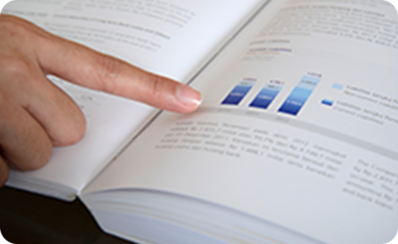 developments with the objective of achieving working methods improvement. Based on the audit results gathered in mid-2011. All of the company’s facilities including tank terminal facilities, ports, jetties, trucks, tankers, barges, and manufacturing production facilities have met the government’s standards of safety and environmental regulations, as well as international safety standards. PT AKR Corporindo, Tbk recognizes that occupational safety and health as well as environmentally friendly are key to long-term business sustainability. Therefore, we are committed and responsible, to protect the Health and Safety of Employees and all parties involved and prevent the occurrence of work accidents, occupational diseases, and environmental pollution. We are committed to comply with legislation, to follow the design and operating standards and to monitor the implementation of its performance by considering the aspects of occupational health and environmental norms at each stage of the operation. We are also committed to provide reliable resources with management support to achieve continuous improvement of S.H.E. We all the management and employees of PT. 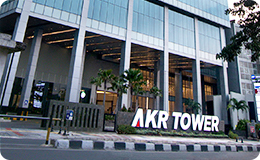 AKR Corporindo, Tbk is committed to build a Safe, Health Culture, and environmentally friendly by making this S.H.E policy as the responsibility of every employees and parties involved with the company.